If you visited the zoo prior to the twentieth century you would most likely have seen the animals behind bars in cages. 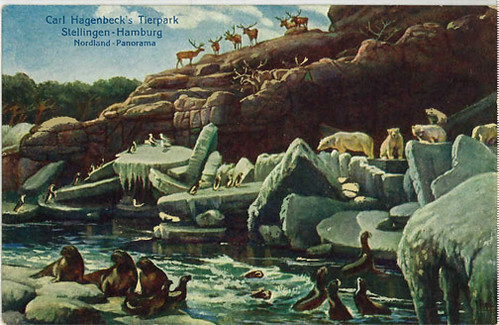 But in the early 1900s Carl Hagenbeck decided he wanted to display animals in a more "natural" venue. 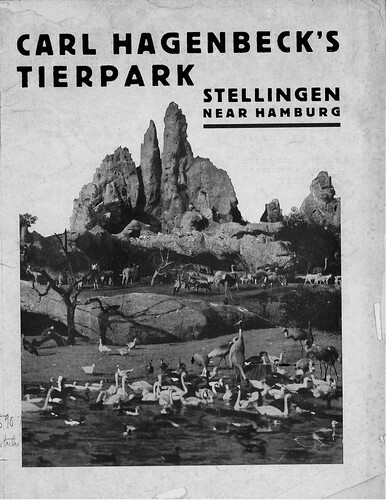 After years of working in his family's wild animal trade business he created his "Tierpark" in Stellingen, Germany. “What is now taken for granted by almost every visitor to a zoo—moated exhibits in a landscape simulating nature; gregarious animals of mixed species kept in herds in large enclosures; and animal performances based on conditioning and sensitivity, not on brute force and intimidation—all started at Hagenbeck’s Tierpark”—Herman Reichenbach, New worlds, new animals: from menagerie to zoological park in the nineteenth century, edited by R.J. Hoage and William A. Deiss. Baltimore : Johns Hopkins University Press, 1996. A crowded ark, by Jon R. Luoma. Boston : Houghton Mifflin, 1987. Zoo: animals, people, places, by Bernard Livingston. New York: Arbor House, . Zoos without cages, by Judith E. Rinard. Washington, D.C.: National Geographic Society, c1981. Carl Hagenbeck’s autobiography: Beasts and men: being Carl Hagenbeck's experiences for half a century among wild animals, an abridged translation by Hugh S.R. Elliot and A.G. Thacker; with an introduction by P. Chalmers Mitchell; with photogravure portrait of the author and ninety-nine other illustrations. London; New York: Longmans, Green, and Co., 1910. The Libraries' online exhibition: Zoos: a historical perspective, by Alvin Hutchinson. Visit the Zoo Day—Dec. 27th! Not sure I would want to go through the lion and bear exhibitions without the bars.